The other night was a little bit stressful because things didn’t go according to plan and we had to adapt. In truth, the only real issue that caused any amount of concern was getting replacement tickets for the train ride we had missed (see the previous post). We really had no idea what to do. Vanessa had taken care of all the train plans, so I was just following along – so I felt completely unfamiliar with what was going on, or even what we were trying to even do. I’m not so sure she had any more confidence than I did, but she handled it perfectly. We wandered around the train station for a little while, and found what looked like ticketing windows. In fact, there were 3 different lines for what appeared to be 3 different services. One was clearly for International travel, but the other two lines weren’t obvious. The shorter of the mystery lines seemed like a fancier service than the other, had one open service window, about 5 people waiting, and was labeled something related to “Immediate” plans. The other line was a mystery, but had about 15 people in line and 3 open windows. V had the tickets and got in the fancy immediate service line, and I got in the longer one to hold a place in case hers was wrong. She got to the one window, explained the situation (we missed our train 15 minutes ago) got tickets for tomorrow’s 9:15AM train, and learned that the 5 or 6 hotels that the woman on the other side of the window would normally recommend were all full. My line didn’t move at all in that time. We had new tickets for tomorrow’s train, and needed to find a place to sleep, ideally near the station, and it was starting to rain a little. Rain? It’s Summer. My Marin County-native mind does not get this. 2 Weeks ago I was in Fort Lauderdale, Florida for a meeting with DHL and it rained. It seemed so wrong. Winter = rain. Summer = sun. Right? Well, apparently not outside the bubble. So, light rain, new tickets, need a place to stay. Oh, and we don’t really have phones because we’ve shut off all data/voice in fear of million-dollar charges. BUT, we got online using the free WiFi throughout Paris, searched for hotels in our vicinity, and picked a pair based on price. We dragged our luggage 3 blocks and got a room. A tiny, tiny room. It did have a queen-sized bed and 2 twins, but those took up pretty much all the space. But it worked, and only cost a couple hundred bucks. <gulp>. We dumped our stuff and went out to eat at one of the many curb-side eateries while watching the Germans smack the bejeebers out of the Brazilians in the World Cup semifinals. Here’s the fun part, and the reason for the photo: Anyway, 20 years, ago, when I did a Eurorail-style tour of Europe with my friend Danny, early into our trip we adopted the ideal that “everything works out,” because, well, everything worked out. We lost a passport in Amsterdam, but got it replaced; We had trouble finding places to stay in Pamplona, but eventually found a spot in the park; Got lost in London, but found our way back; and so on. 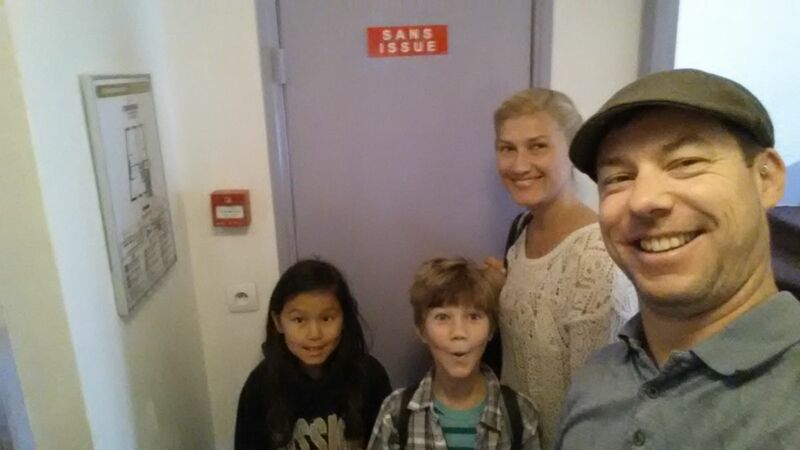 Forward to now: Outside our tiny hotel room, across the tinier hallway was a sign on a door reading, “Sans Issue”. Within the confines of our extremely limited French, we liked the idea that it meant, “Without Issues” (knowing it probably didn’t). Here we are again: No train, no language, no hotel, but it worked out fine. No Issues. Just a reminder that little hiccups in plans and hurdles to work around will happen. They’re only as big as we make them.